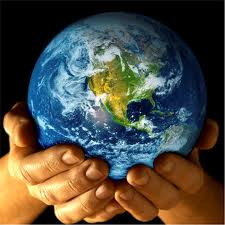 How Many Planet Earth’s Are Needed To Support You? Within recent years, the push to Go Green, has bombarded advertising campaigns, our daily lives and many of our lifestyles. With my decision to find more natural products to use in my hair, it has forced me to look a little deeper at the foods I eat, the resources I waste and the products I use. While I know I’m not as Green as I could be, I did believe that I was greener that most. Today I took a test to gauge my ecological footprint, which is “a resource accounting tool that measures how much biologically productive land and sea is used by a given population or activity, and compares this to how much land and sea is available,” via Earth Day Network. Well I took the test. It questioned me on everything from what kind of siding is used on my house (brick) to how often do I shop for clothes and everything inbetween. As I answered each question, I was careful to be honest. It was obvious what the “right” answers were, and from how little I picked the “right” answer it wasn’t long before I realized how anti-Green I actually am. By the time it was all said and done (about 5 minutes lol) I discovered that if everyone were like me, it would take 4-7 planet Earth’s to support us (on another test I took, that wasn’t as good as this one, they said that on a scale from 0-25 I was a 17…but I don’t know what a 17 means, hence why I like this test better…it helps you understand the true impact of your lifestyle and what it’s doing to the Earth). The good news however is that they give you plenty of options, advice and alternatives on how to become Green-er. lol! this summer we’ll both be able to take back those “car” points…public transportation all the way!